Reserve leaves from rosemary stripped off stems and chop roughly. Place squash and peppers on baking sheet, skin side up on peppers, and spread in a single layer. Drizzle with ½ Tablespoon olive oil, salt and pepper and a sprinkle a little of the loose rosemary. Roast until tender, 15-20 minutes. Let cool slightly and remove skin from peppers. Whisk garlic, vinegar and 3 Tablespoons of oil in a large bowl and add salt, pepper and a teaspoon of loose rosemary. Add vegetables and cheese and allow to marinate for at least one hour. 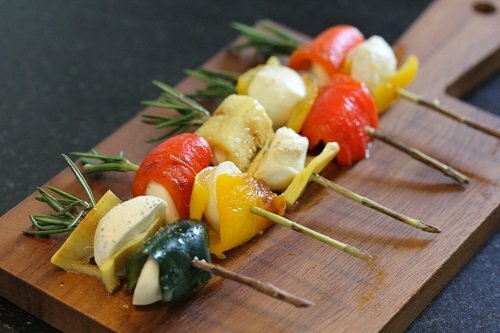 Drain vegetables and bocconcini, then spear on rosemary skewers. Serve.